Heart On The Line: Waaahh!! Oh. My. Gosh. I'll cry with you. Eeek! Did you have the warranty? Oh no!!! Does it still work with just a cracked screen? Are you hyperventilating, crying or sobbing? I think I would be doing all 3! I can still take pictures, I just can't see them on the screen and there are some camera settings that I can't adjust without seeing the screen, which is a problem. Shawn just called a camera repair place and it sounds like it might not be as expensive to repair as I initially thought (although still not cheap! ), so that's good. The last thing I can afford right now is a new camera (although cameras are my very favorite thing to buy!). Oh no! I'd cry too! Luker coming out of lurkdom to hopefully help...have you checked if this is covered under your homeowners policy? It may be! Call your insurance agent. Hope this helps. Homeowners insurance!!! It is very likely covered. 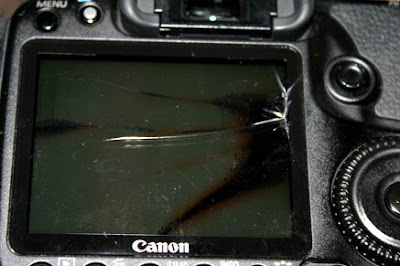 I had a friend drop a Nikon D40 off a boat. Homeowners covered the replacement. It would definitely be worth a call. Oh Dear! And it looks like we have the same camera! Oooohhhh... sooooooo sorry! Let us know what happens!